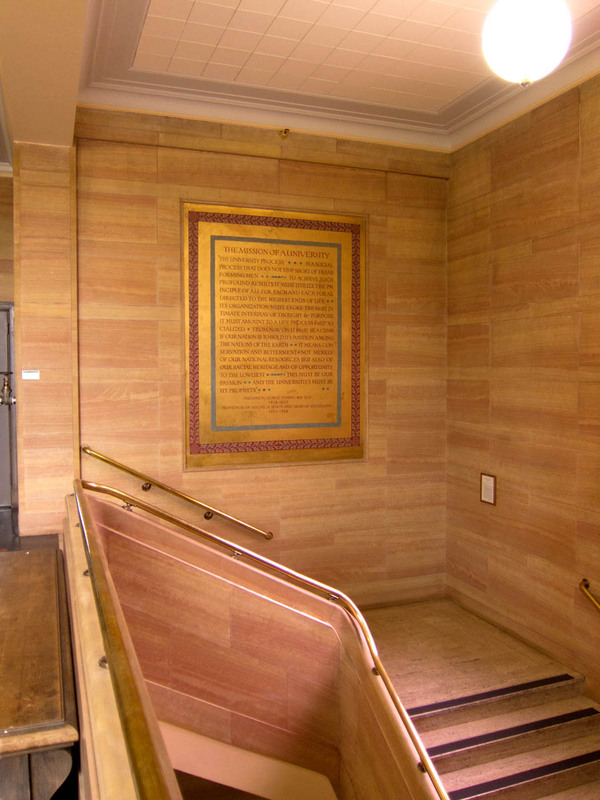 N. B. Zane designed the mural Mission of a University (text: Frederick George Young) in the west stairwell of Knight Library and Opportunity for the Youth of Oregon (text: Luella Clay Carson) in the east stairwell. School of Architecture & Allied Arts Faculty, 1927. N. B. Zane is third from left, front row. Nowland Brittin Zane was born on February 17 , 1885, to Enos P. and Maria Zane in Christiana, Pennsylvania. In 1921, he joined the faculty of the School of Architecture and Allied Arts as an instructor in space art (interior design) and decorative arts. His interest in decorative arts and design made him a natural candidate for creating the inscription murals in the historic Knight Library. He is also credited by one source with designing the two plaques over the entrances of Knight Library which split the text, "Ye Shall Know the Truth" / "The Truth Shall Make You Free" (text: Jesus, quoted in John 8:32) but this has not been substantiated and the Lawrence firm likely designed the simple lettering for those objects. Among Zane’s surviving art works are two large murals over the lobby staircases of the Elsinore Theater, Salem, Oregon, a building designed by Ellis F. Lawrence (Lawrence and Holford) in 1926. The murals depict scenes from Romeo and Juliet and Macbeth. Zane’s essay, “Appreciation of the Space Arts,” was published in the book Studies in Appreciation of Art (Eugene, Or. : University of Oregon, 1934) edited by R. W. Leighton. 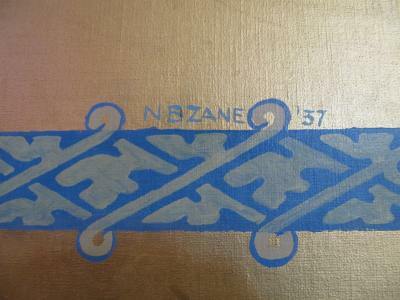 N. B. Zane retired in 1944 due to illness and on November 18, 1945, he died at his home in Siltcoos, Oregon. << Previous: Thomas, Ernest B. "Death Takes Art Figure." Oregonian, November 21, 1945, 11. Elsinore Theater, Salem, Oregon. National Register of Historic Places. Access: Oregon Historic Sites Database. Zane, N. B. "Appreciation of the Space Arts." Studies in Appreciation of Art. Edited by R. W. Leighton (Eugene, Or. : University of Oregon, 1934). Zane, N. B. "Selection and Development of a Picture Study Lesson." School Arts Magazine 20 no. 4 (December 1920): 27. "Zane Retires as Art Teacher." Oregonian, August 6,1944, 13.